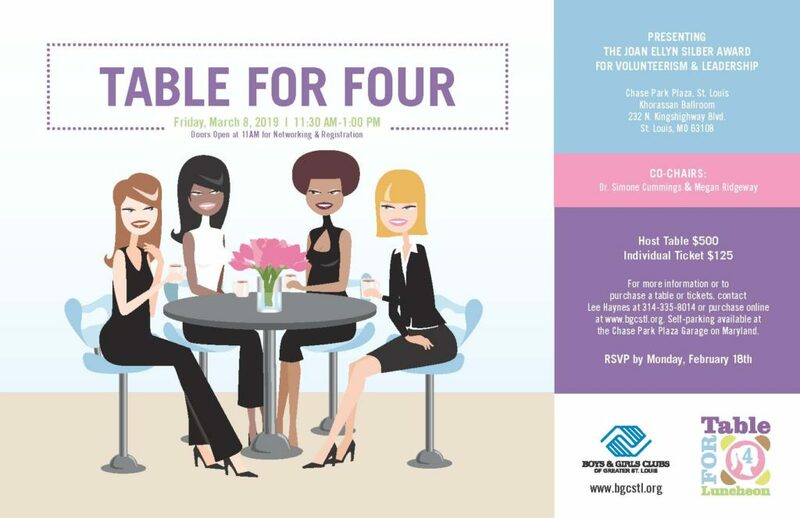 Grab your colleagues and/or closest friends and join us at the BGCSTL annual women’s luncheon, Table for Four on March 8, 2019, 11:30 am – 1 pm at the Chase Park Plaza. In its 11 year history the event has raised over $300,000 to support the growth and development of our young women. Proceeds from this event support activities and experiences designed to help girls develop healthy lifestyles, positive self-esteem and make good decisions. Over 200 guests are expected to attend. The inaugural Joan Ellyn Silber Award for Volunteerism and Leadership will also be granted to one of our teen girls during the event. To sponsor the 2018 event, click Sponsor Reply Form 2018. To download the fact sheet, here. For more information, contact Lee Haynes at 314-335-8014. Lend your name, help us secure sponsorships, and host a table for four with three friends or colleagues. For more information about this event, contact Lee Haynes at 314-335-8014.